The Eff Eff 17 Series is designed to be used on UPVC doors. But please be aware this lock only secures the latch not the locking mechanisms. 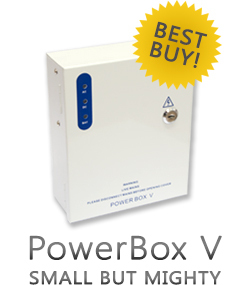 - NOW WITH AN EXTRA 5% OFF! Hi, guys. 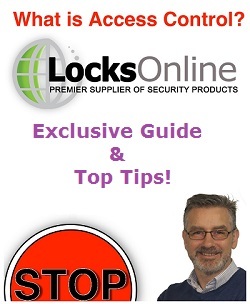 My name is Darrel and I'm head of the tech team here at LocksOnline.co.uk. Thanks for taking some time to tune in and have a look at one of our product review videos. Today we're talking about strike releases and more importantly we're talking about the EFF 17 Series strike release that comes with a unique faceplate that in reality has been designed for UPVC doors. But it not only can be used on UPVC doors, it can actually be used also on sash locks etc., where you want to use the latch as a form of access control. So let's get the product out. Let's have a look at it, and I'll try and explain my way through it as to the benefits and the advantages that you may ascertain in this particular type of strike release. And here's the guy here. Now as you can see, it's come with a long faceplate, and it's a substantially thick faceplate as well, as you can see there. But it has this cutout here, which is designed for a bolt option, okay? So one thing you need to be aware of is that UPVC doors these days is that you lift the handle up, and by lifting the handle up you engage all the multipoint throughout the whole door, and obviously there's an opportunity for a bolt to go through as well, okay. So that's what you need to be aware of on this particular type of strike release. Now I want to talk to you a little bit about the multipoint locks that will work with this, and what are the strengths and weaknesses, or what are the upshots and the downsides in regards to using a particular type of strike release? Now what you've got to bear in mind is on this particular strike, it only secures the latch. It doesn't secure the locking mechanism, all right? So if you lift the handle up and you throw the all the bolts into its place, you're not going to be able to take advantage of an electric strike. But in some applications you may find that if you were to put a panhandle on the outside or a fixed handle on the outside, all right, and you just wanted to use the latch in which to keep the door locked, then you can actually use this strike release. All right, so it's well worth you being aware of that. I will always recommend that you have what we call in the trade a windup lock where you do not need to lift the handles up. So here would be a technical solution and a scenario for that. For an example, in the daytime the door would be locked and would be used on the strike release. So it's a form of passive security. When you close the door at night, say in an office or something like that, and you want to secure it, you put the key, and throw the key. So what we call winding up. And all the bolts then go into place by winding the key up and throwing all the bolts into place. Now if you have that type of lock on your door and you do not need to lift up the handle, then this is going to work well for you in that particular application. The chances are, the majority are lift up and therefore you need to be aware that your security may be compromised if you decide to use this type of strike release. The multipoint locking solution may not be able to work in conjunction with using a strike release in this particular application. But that doesn't mean to say it's the end of the day, or it doesn't mean to say that you can't use it. I just wanted you to be aware of its strengths and its weaknesses in that respect. So let's talk a little bit more about the strike release in itself. This will work on 12 volts AC or DC, and it actually has a significant holding force of up to 1500 pounds or 675 kilos if my conversions are correct. One of the distinct advantages that you'll see here is that you can look there. There are two screw holes in the actual jaw there, and that allows you to move this jaw inwards and outwards depending on how you have fitted it, so it gives you a little bit of degree of margin of error if you've fitted this slightly not just right, or you've got a bit of expansion or contraction throughout the day and you need to adjust that depending on the seasons, etc. So you have that degree of flexibility there. That will move somewhere in the region of about 4 or 5mm. So you've got that degree of flexibility. What you'll also notice as well is that the screws for fixing it sit off centre, all right? So they're designed to actually get into the meat of the plastic door, and hopefully you get the screw. Now they don't come with screw fixings; you need to supply your own. But you'll need to get into the steel core of the actual frame to get good security and a good fixing on this particular type of strike. Now let me get some measurements for you to help you make an informed decision. So we're talking here, the faceplate there is 26mm, the fore end length from the top to the bottom there is 224mm, 225mm length overall. The actual depth of the jaw there is 6mm, okay, and what I'm going to try and do is from the leading edge to that central, that screw there, I'm just going to try and get you the offset there. It's probably 16mm there, okay, guys? So it's slightly sits off centre there. And that's obviously designed to get you a better fixing into the fabric of the actual frame. The actual distance from, I'm going to say from the centre of the latch here to the centre of this one here, to give you some sort of idea, because that might be important for you to be aware of that, you're looking there at around about 110mm, okay? Or 110mm, I'd be comfortable there with 110mm. And the actual width, the height of that particular part there is 53mm. So check your bolt to make sure that it's not too wide to go in there. The actual depth of that as well, the size of the opening there is round about 12mm, so that's more than enough for a load, for multipoint locks, etc., to get a bolt into there. So as I've said you can actually use this on a mortice lock for a wooden door. There's absolutely no reason why you can't. So therefore you could, if you wanted to, have a sash lock where you could use the latch throughout the day without any handles, and again you could deadlock the door at night to give yourself that maximum security. If you're thinking of doing that with a standard sash lock, then of course you need to get rid of that handle on the outside, so you need to be considering using a sash lock like the Enfield that we have on our site, where you can actually put the key in and withdraw the latch via the key where you don't necessarily need a handle. In which case, this could work really well with that particular application. But if you need a bit more information or a bit more advice about this particular product or any of our products that we have on our website, by all means, give us a shout. Use the live chat that we have on our website during the working day, it's totally free. And you can chat with me or any of the guys in the sales team or the tech team. We'd be more than willing to help you out in any inquiry that you have. More importantly for us, come and be a customer of ours, we'd really appreciate that. So from me, Darrel, and all of us here at the team, take care. We'll be catching you real soon. Bye-bye now.